This was Aaron Rodgers as a 21-year-old Packers rookie. Published Sept. 14, 2017 at 7:41 p.m. If OnMilwaukee's Carolynn Buser, Hollywood actress Olivia Munn and just about every female Packers fan in Wisconsin are any indication: people like how Aaron Rodgers looks. Indeed, the Green Bay Packers quarterback and two-time NFL MVP is a handsome dude. He's the ubiquitous spokesman for numerous big brands, such as State Farm and Ford, and he's an increasingly familiar, well-dressed sight on awards stages, red carpets and high-profile sporting events. In fact, his bearded, beaming face was just featured, unmasked, on the cover of this month's ESPN The Magazine. But the now-hunky Rodgers – who was a scrawny teenager and a disregarded football prospect growing up – has had a lot of looks over the years. Since being drafted by Green Bay in 2005 at the age of 21, in his annual headshot he's sported short hair and long hair, had it styled and let it lay flat; he's been clean-shaved, stubbled, scruffy and rocked a full beard at different points; sometimes he's smiled, sometimes he's smirked, sometimes he's looked like the photographer just asked him about his little brother. Only his piercing blue eyes stay the same. And this new animation, created by the design staff at sportsbetting.ag, shows how Rodgers' appearance has changed from his rookie season until 2017, via a morphing GIF. OMG I FORGOT ABOUT THE LONG HAIR PHASE! According to Ryan Taylor, who handles public relations for Sports Betting, the animated GIF is produced by manually lining up similar points between two images (corner of the eyes, corners of the mouth, hairline, etc. ), repeating that process over and over and over, and then layering the images on top of one another. Special software then generates the transition effect between each image. Taylor says the Sports Betting designers usually create these projects as fun, cool things to post on their social media accounts or blogs, but he likes to spread the word on them to news outlets and sports publications, because they are popular and highly shared. The Sports Betting guys have put together similar GIFs of other athletes, including LeBron James and Tom Brady. Yeesh, it's not hard to see why Brady wasn't drafted until the sixth round, but how do I get on that aging curve? As for Rodgers, he's gone from looking like a kid in his middle-school class picture to a 33-year-old GQ model. 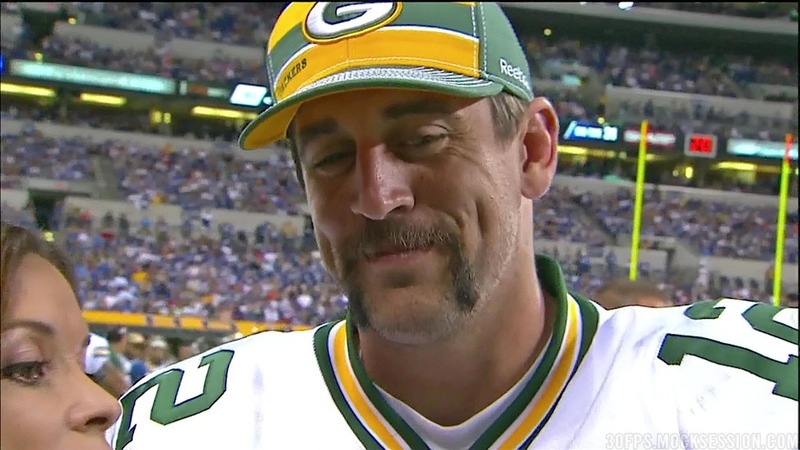 Now, if only we can get Sports Betting to do another one of Rodgers' annually magnificent moustaches. Long live Aaron Rodgers rookie photos.